This thread regroups Rikiki's miscellaneous mods: designed to fit to the best with vanilla ambiance. Each one expands a particular aspect of the game. They are independant, so you can only pick the one you are interrested in! Please see this thread for MiningCo. mods. Fish Industry: adds fishing to the game, from simple fishing pier to the advanced aquaculture basins. Caveworld flora B18! : adds some pretty mushrooms glowing in the dark caves of this world. Cave biome A17! : adds a new biome: the caves. Campfire party A13! 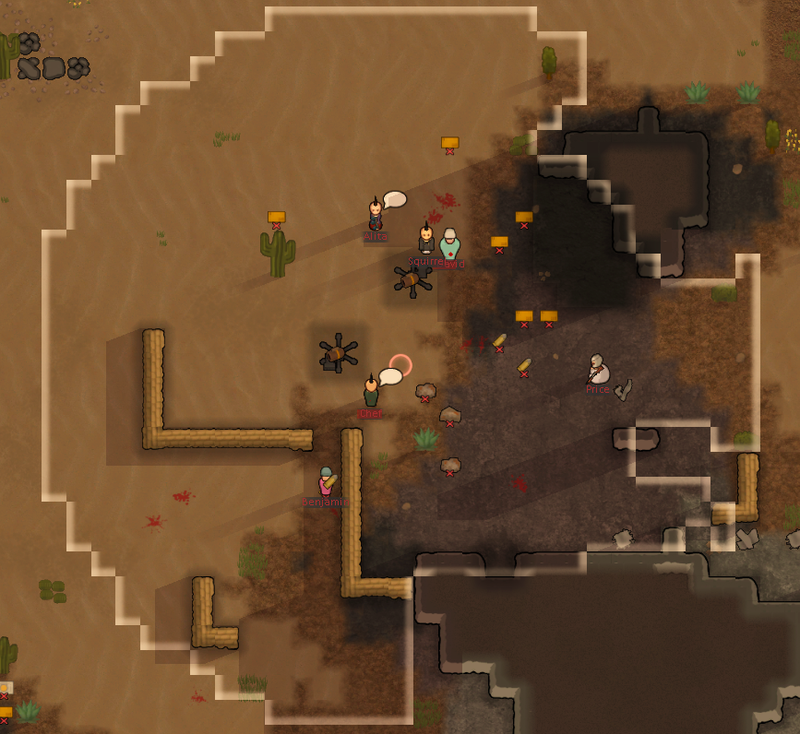 : adds a pyre to organize parties for your colonists! There is so much water in this world and you always dreamt to eat a fresh grilled fish! 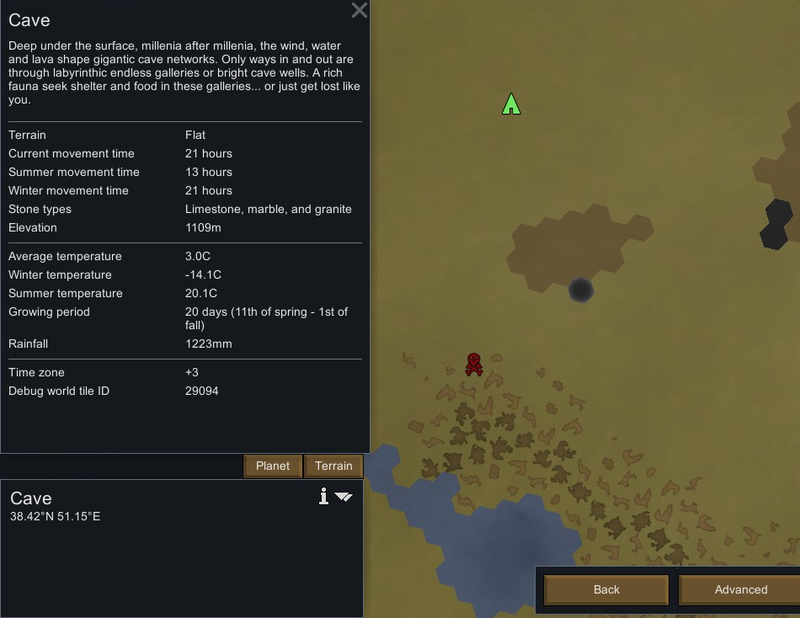 Here it comes, the Fish Industry debarks in Rimworld! Fishing zone: designate a zone where your fishers can fish. Waters can be dangerous if tailteeths live in this biome. Fishing pier: simple building built on water. Allow your hunters to catch safely some fishes. Use corn or rice to fasten fish catch! Aquaculture basin: advanced building used to breed some aquatic species. Expensive renewable source of meat. Is unlocked by "Aquaculture" research after "Hydroponics". New recipes at the campfire (to cook a grilled fish simple meal). New meditative joy activity on fishing pier (watching shiny water). Fishing is a hunting job. The jobs' priorities are defined as follow: hunting > operating aquaculture basin > fishing at fishing pier. You can stop fishing activities by forbidding the pier or aquaculture basin. Please leave me your feedback so this mod's balancing can be improved! Any constructive criticism is always welcome! * Added Japanese translation thanks to Proxyer (Steam user). * Added modOption to adjust fish respawn rate. * Lot of code optimizations. * Reworked fishing zones so pawns only catch fishes from bank (to avoid "wet socks" mood penalty). * Aquaponic basin can start breeding fishes without corresponding corpse (simplification). * Improved inspection strings and breeding start condition (food available, no microfungus, ...). * Aquaponic basin now needs regular maintenance. * Maintenance will boost fishes' growth and reduce microfungus duration. * Replaced bubble effect by swimming fishes. * Fishing pier is now buildable on bridgeable zone (no more on deep waters). * Added fishing zones. 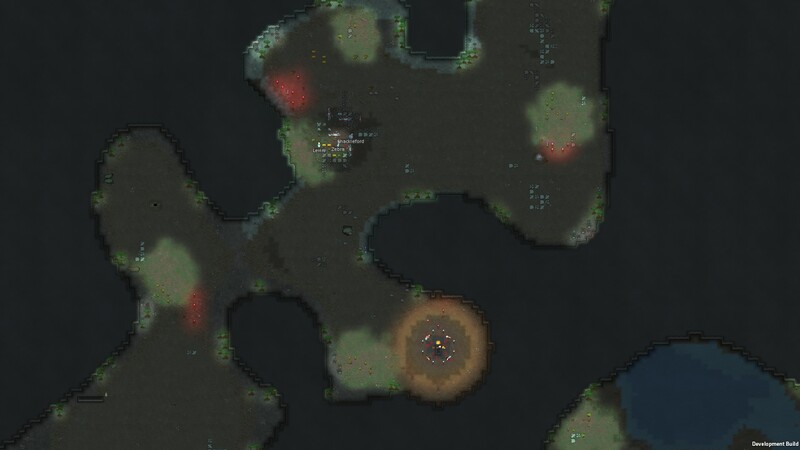 It is free but your colonists can get hurt by tailteeths when fishing in this zone. * Fishing pier now requires a research. * Fishing at fishing pier is safe. * Removed specific hopers. Now use standard one. * Removed temperature mechanism for aquaculture basins. * Completely rewritten fish resplenishment algorithm: it is now greaty impacted by biome, growing season and events like toxic fallout. * Corpse generation improved to remove the sound and sometimes "revenge" alert. * Added Chinese translation thanks to duduluu. * New patch to get fishes in cave biome. * Disabled manhunter event for fishes. * Improved Mud terrain patch to be more compatible with other mods (thanks to dismar!). * Fishes are now biome-dependant (tailteeth is only found in warm biomes for example) and environment-dependant (some fishes are never in marshes, some are never in river/ocean...). * Fish stock resplenishment rate depends on the biome and the available water space around the pier. * Added a resplenishment rate indicator when placing the pier. * Reduced fishing pier food income. * Aquaculture basin now properly reset the bill to avoid wrong usage. * Many small other improvements. * This is a HEAVY update. Fishes are now normal corpses (instead of items). They can be butchered like any other animal. * removed fishing tools and job for simplicity. * fishing now takes a lot of time (1500-4500 according to hunting skill) but will be nearly always successful. * Mashgon needs to be butchered again. * rebalanced all fishes stats. * max fish stock is computed according to biome and available aquatic cells around the pier. * fishing pier can now be built on mud for a higher price. * All fishes can now be eaten raw (at a cost of course!). * Note: it may be hard to select the fishing pier blueprint (drag a square around it) due to the new terrain requirements. * Mashgon no longer need to be butchered. * Added meditative joy activity on fishing pier. * Removed force field net (I felt it was too much for a fishing mod...). * Added a message to warn you when an aquaculture basin's bred fishes die. * Increased fishing duration at fishing pier. * Fishing is now a completely separated job. It has its own job, stat and skill. * Fishing at the pier increases the fishing skill. Fishing duration is impacted by fishing skill. * Removed the pearl ear (was too ugly and not very useful). * Several small improvements in job drivers. * Lots of balancing thanks to Panzer! General nerf of the caught fish quantity and catch success chance. * New fish thanks to LittleGreenStone: seasnake. * Added a living time parameter: some fishes are caught during daytime, night or both. * Added a specific fisher job so you can easily manage priority between fishing and hunting. * Added small animation details (harpoon, force field net). * Improved the multi-hoppers food search and consumption (now takes food from any hopper, not only full ones). * Added joy gain for pawns who like fishing. * Added an alert for idle aquacultures. * Added a very rare bonus when fishing (still no malus for now...). * Corrected the tribals spawning with force field nets bug :o. * Corrected the inverted logic "catchSomethingThreshold" bug. * Corrected the equipment stack bug (no fishing rod with button-down shirt). * Increased power consumption of aquaculture basin (150 -> 500W). * Temperature is now taken into account for water quality (optimal range: [0.C; 40.C]). Also have a look at the Cave biome mod! Starting a new colony is mandatory or please read carefully the installation section here bellow! Adds 4 kinds of cave plant that will enliven your dark caves. Brightbells can be planted in decorative pots for a nice looking natural lightning. Brighbells: not edible, lights up a wide area. After researching fungiponics, fungiponic basin will allow you to grow your own mushrooms. You can also plant brightbells in plant pots to get a natural lightning. Add some poisonous plants when I get some time... => done in Cave biome mod. Balancing a mod is difficult, especially with plants. Please leave me your feedback to help balancing! * Corrected inspect string for Cluster and ClusterPlant. * Completely reworked source code. * Plants now grow in cluster. This is mainly used in Cave Biome mod. * Gleamcap breathing is now a hediff. * Added skill requirements to grow in fungiponics. * Correct a bug where brightbells could not grow on plant pot if away from natural rock. * Correct a potential null reference exception. * Brighbells lights a wide area and can be used as a natural lightning source in decorative pots once Fungiponics is researched. * Other mushies light area has been lowered. * General balance, may still need some tweaks. * Added the fungiponics basin. * Correction of minor XML errors (nutrition values). * Changed type of ticker type to long (improves performance). Magic and so powerful MapComponent use!!! 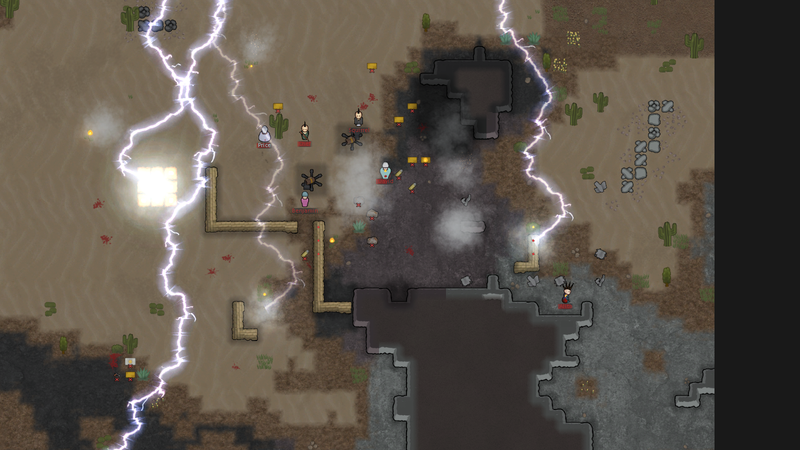 Everyone knows the mechanoids ultimate purpose is to eradicate every trace of organic life. To achieve this objective, they invade and colonize every planet they come across. Warning! Spoiler ahead! If you want a full experience, please only download the mod and play until you encounter the mechanoid terraformer incident. Reading the following may ruin a part of the suprise. Okay, you wanted it! Here is the mechanoid terraformer harnessing some power. Adds a new very bad event: the mechanoid terraformer. Adds a hidden defensive building unlocked after extracting the weather controller from the mechanoid terraformer: the skywrath controller. Unleash the sky's wrath upon your ennemies! Balancing a mod is difficult. Please leave me your feedback to improve this mod. * Alpha 9 initial release. * Fixed some possible exploits (extracting weather controller without disabling beacon first for example). * Slightly reduced the frequency of strange thunderstorm. * Small correction in the Skywrath controller xml definition. * Skywrath controller power consumption increased during charge (6000 -> 7500). * During other phases, needs only 20% of this power (so 1500). * Skywrath controller power consumption increased during charge (7500 -> 10000). * Balance in research skill requirements (reduced skill min level to study, extract and reroute). * All job on the mechanoid terraformer now give some XP in research skill and take into account the research speed. 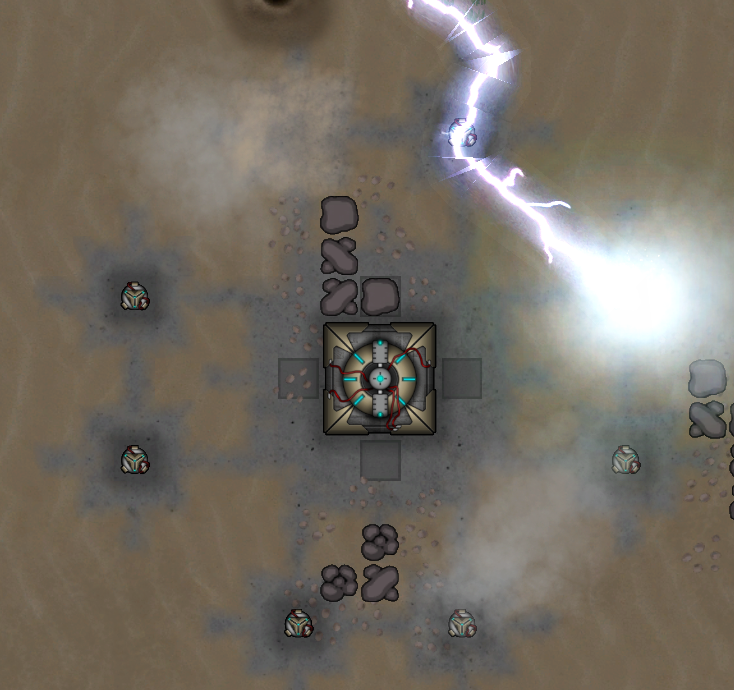 * Modified the strange thunderstorm so it is much shorter but also more powerful. * Increased the rerouted terraformer power output: reliable 5000W output + variable energy during thunderstorms (up to 37000W with 8 pylons, may need some balance...). * Skywrath controller research is now properly hidden. This event does not include additional mechanoid types (like the crawler). mrofa for the beautiful mechanoid terraformer and pylon textures. Haplo for his job tutorial. I made good use of it! 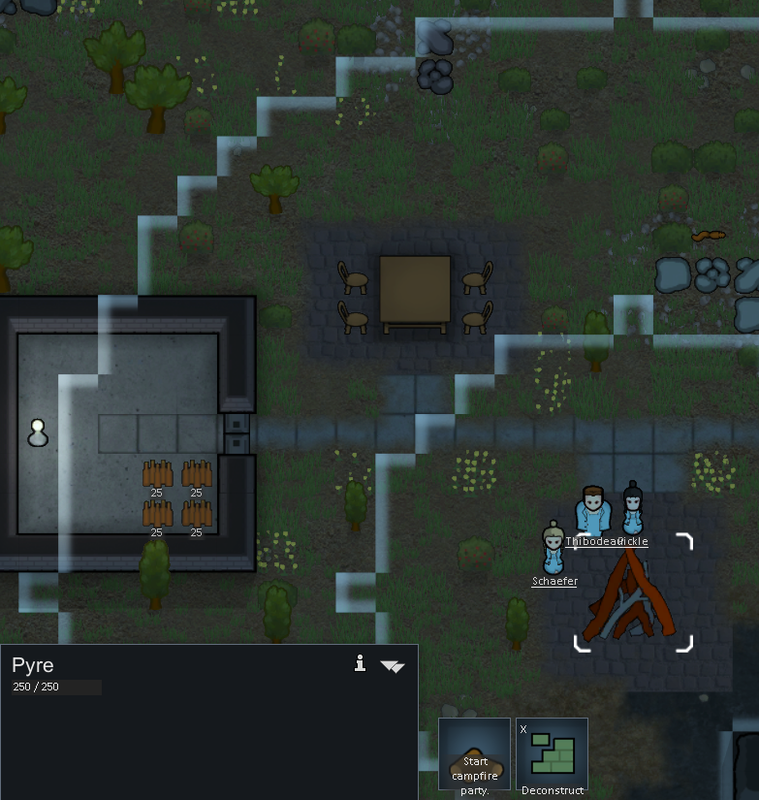 This mod adds a pyre to organize campfire parties. Starting a new colony is NOT necessary! 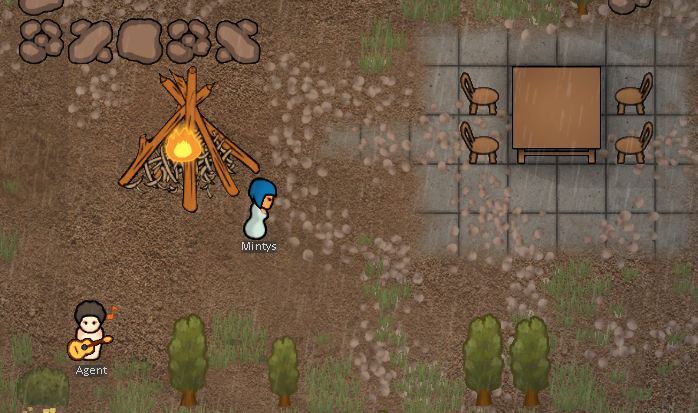 Organize campfire parties for your colonists! Some character traits will impact the revelers behavior (psychopaths, chemical interest level, trigger-happy, nudist). 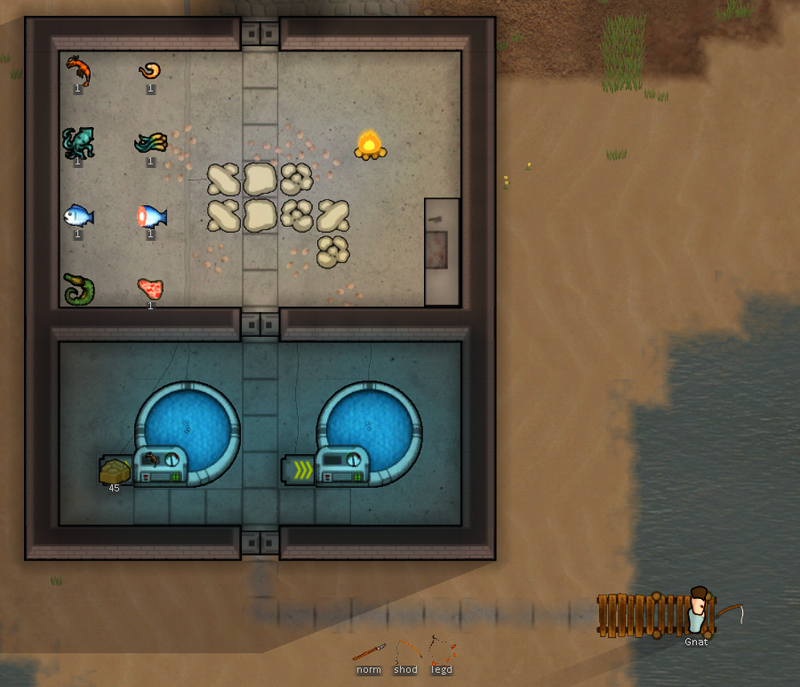 Provide them some beers because your colonists NEED some beers in this harsh world! Gather your colonists near the pyre. Click on the pyre's button "Start campfire party". You must draft and give him/her any order (move, bill, ...). * Readded abstract base def (improve compatibility). * Integrated pyre texture from skyarkhangel. Pyre texture is a donation from skyarkhangel. Thank you mate! Maybe add a tribal-style ritual? This mod adds a new biome: caves! 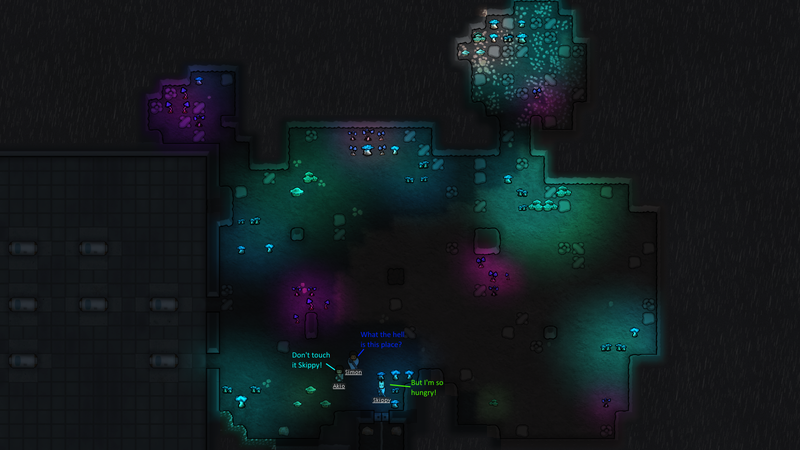 Explore and settle a new colony into the deep and labyrinthic tunnels deep underground. This mod requires the Caveworld flora mod! Starting a new world is necessary. Adds a new biome with custom caveworld flora. Permanent darkness so growing will be hard. Most events can still happen (you will get raided!). Adds a new mineral: cold crystal. Can be used as a permanent torch but it drains surrounding temperature. Adds underwater power conduit (so you can build a colony across the river). * Now use patches for incidents, mortars and solar generator. * Added underwater power conduit. * Removed mechanoid ship building copy as it is no more internal. * Fog weather now removes filth. * Reworked cave well light with help from jtgibson01! Reserved: pfiou, got it all! Oh, these are great ones! I really want to see more reserved mods! what the shame to create empty topics from nothing, I hope you will be banned! He is in the process of building the thread mate. Thanks for all the fish Rikiki! Please be patient and come back later! Do you really think I would mess up on this forum with more than 500 posts?